I’ve been reading A.S. King and learning how to write. Every one of her books is a meditation on the art and craft of the novel. She is wonderful. I just finished her first book, Dust of 100 Dogs, and her latest, Reality Boy – back to back. I’ve read all of her books inbetween also. 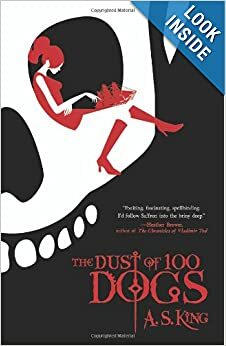 Dust is part pirate tale (female protagonist), part coming of age story, part love story, part dog story, part modern and part historical. How would you take being born aware that you were a pirate and then, because of a curse, forced to the live the lives of 100 dogs, before you were again born into present day remembering each of your previous iterations fully? The pirate story and the modern story are told in parallel as are a number of dog stories. You know the ending at the beginning but it doesn’t matter because you still don’t know how exactly King will get you there. This is a great technique and very hard to pull off yet she did this with her first novel and in such an engaging way. I was so caught up in the story I kept thinking to myself, maybe it won’t end the way she said. I knew the way the story ended. She’s cursed and lives the lives of 100 dogs. But still… I knew how it ended in general, guessed the specifics, and still felt a lump in my throat when I got to the last page. Reality Boy is so different and so visceral. You can read the synopsis on Goodreads. I’m not going to give it to you. It’s still too fresh for me. A good book will do that to me. It has to settle. I found tears on my cheeks a few times reading Reality Boy, and not because I felt manipulated but because the authenticity of Gerald’s (the protagonist) situation made me – feel. King is expert at capturing what it’s like to be in late adolescence (17). As an example. Gerald has a developmental insight at one point (he sees the world from someone elses point of view). I know this sounds mundane, but it’s hard to explain this kind of world view to adults and for me, King really puts us inside Gerald’s head and shows us his realization in such a painful and amazing way. And it is amazing, in a story telling world accustomed to cartloads of over-the-top action, explosions, and gun-play, how powerful a single moment of genuine insight from a character we care about can be. What will she write about next? This entry was posted on November 6, 2013 by Joe Lunievicz. It was filed under A.S.King, Blog, Book Reviews, feelings, Goodreads, High School, Historical Fiction, On Writing . I read Amy’s books in this order: Ants, Dogs, Vera, Passengers, Reality Boy. Dogs is so weird, it’s wonderful. It was edited by Andrew Karre when he was still at Flux, before he moved to Carolrhoda. I have no idea how she managed to sell that book as a debut, but I’m glad she did, because it is awesome. I especially loved the parts in Ireland. Reality Boy is so … infuriating. You feel so bad for Gerald, you just want to rip him out of his situation. Of course, it’s also wonderfully told, through Amy’s distinct understanding of humanity and character, and I completely agree, it really makes you FEEL. Completely agree. I read Ants, Vera, Passengers, Dogs, Reality Boy. It’s quite a lineup. Definitely. Have you met her? I was a little intimidated at first, but she was very kind, and very funny. I have never met her but would love to, though I don’t know if I’d do anything but stand there with my mouth open saying, “aaaaaaaa.” I’m easily starstruck. Yeah. I was shy for a few minutes, but she was too nice to let me stay in my shell. Ellen Hopkins was even more intimidating, but I did end up talking to her. But … Devid Levithan. I couldn’t get up the courage to introduce myself to him. I love love love Amy’s books! My lineup: Ants, Vera, Passengers (which I am still reading). Next for me: Dogs, Reality Boy. She’s so talented. Joe, I love the first line of this blog post, “I’ve been reading A.S. King and learning how to write.” When I first read Ants and (two years later) Vera, I rearranged every sentence of my current novel. I’m still reeling from how her words, the way she frames her stories, her stirring originality move me to push myself to previously unimagined heights. Also, Matthew: I felt the same way about David Levithan. This was the man, after all, who wrote The Realm of Possibility. Fortunately I did force myself to speak to him. He is the sweetest person and so humble. I could sense he was genuinely touched that I’d read so many of his books, that I’d come to realize the importance of owning my sexuality based on what I felt when I read his books. Next time, you should totally engage in a conversation with him–he’s so kind. P.S. — Joe, I’ve got your book on order from my library. I cannot wait for it to come in. I agree. Each of her books is unique, each original, and each completely her own style. I love reading author’s first novels just to see where they started from and Dogs is such a good and fascinating and page turning read. When you read it and Reality Boy you’ll have to let me know what you thought of them. I’ve never read David Levithan… but now I’ll have to check him out. His work sounds compelling. As for my book I’ll keep one eye open and one eye closed and hope you like it too! I know you’re probably right, Anthony. After all, he was very kind and gracious on his panel. I think I was just intimidated by the fact that he’s such a pillar of publishing, you know? I mean it’s not often someone is a famous bestselling author AND a big six editor.